It's peak fig season and if you were in any doubt that this has been an exceptional summer in the UK, check out the English figs reaching markets this year. Yes, keen gardeners do plant fig trees but outdoor grown figs at best amount to a semi-ripe handful of fruit; at worst, a maddeningly unripe crop of waxy green globes. Summer's lease usually expires right when we're thinking just one more week of sun, please. So, if you don't have your own fig tree, the chances of getting even a single English-grown fruit is, usually, a forlorn hope. The fig is a member of the mulberry family. 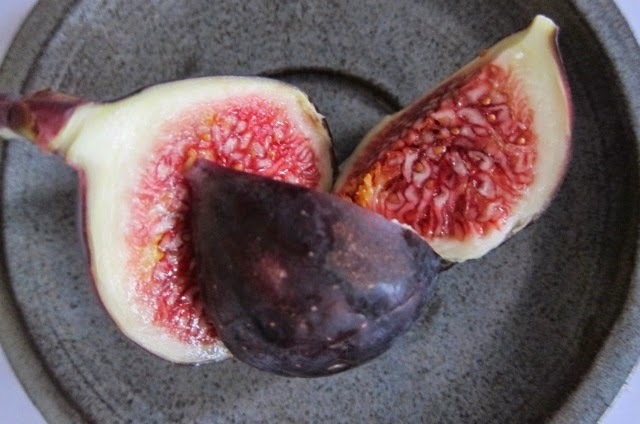 Notable European figs include Black Ischia, (dark purple in colour with golden flecks and a luscious violette-red pulp); Adriatic, (a green fig tinged with purple or red with a deep red interior); and the sweet Marseilles, (coloured yellow/green with green flecks and a white pulp). "... couldn't give a fig"
The Romans brought figs to England but very few of the more than 800 recorded species can be grown in our damp, cool climate. They can do well grown in containers if placed in a sunny spot and brought into a cool frost-free place to over-winter. Unlike Mediterranean areas where two harvests a year are expected, we're lucky to get a single useable crop. Figs will not ripen after picking so fruits need to be harvested when they are yielding to the touch between September and October. A droop in the stalk is a good invitation to try your luck. RHS advice is to remove any large fruits that have failed to ripen in autumn but leave any pea-sized embryonic fruit. If they survive the winter, these are the fruits that could provide you with a useable crop. Fruits formed in the spring may ripen on trees grown in a greenhouse but rarely on outdoor trees. The best varieties of fig for our English climate are Brown Turkey. Its skin ripens to a rich coppery-brown with whitish flesh shading to pink or light red; Violette de Bordeaux is a small purple/black fruit with a strawberry coloured pulp; Madeleine de Deux Saisons bears yellow, amber-tinged fruits with flesh a delicate shade of pink; and the Brunswick fig which ripens to yellow with red flesh. If you yearn for your own fig tree, you might enjoy this recent piece by Anna Pavord on the subject. Figs respond to both sweet and savoury pairings. They go deliciously with a good pecorino or a slice of prosciutto. As a dessert, a perfectly ripe fig is perfection just as it is. Some need a little help to bring out their best, but less is definitely more - a sprinkle of sugar or a spoon of honey and a little heat work wonders. If you want it to look like you've made an effort, try these almond stuffed figs. This recipe is based on a memory of a Rose Carrarini way with figs, which must go back 10 years or more. I looked in vain for the recipe in her book Breakfast-Lunch-Tea. My recollection is bound to be not quite accurate, but this buttery, orange scented almond mixture works for me. Pre-heat oven to 180C/160C Fan/Gas 4. Beat the butter and sugar until pale in colour. Incorporate the ground almonds and orange zest. Slice the top of each of the figs and keep to one side. Scoop out a teaspoon of pulp from each and mash it into the creamed mixture. Spoon the mixture into the figs - pile it high - and replace the caps. Place in a baking dish and bake in the oven for 15 minutes. Test if ready by giving a fig a gentle squeeze - if it feels soft and releases a little juice they are ready. Serve straight away with a little cream or crème fraîche. However, you choose to treat them, give a fig!